Todd's parents, Bill & Marilyn, arrived at Cathy's house late Saturday morning, March 1st. Once everything was loaded on the boat, we spent a little time visiting with Cathy before undoing the lines and pulling away from the dock that had been our home for the past two months. The Captain decided we would just make a short run that afternoon and anchor at Egmont Key, in Tampa Bay, for the evening. By 2:30 the anchor was set so we got the dinghy down and Todd took his mom over to the beach for a few hours. It was fairly breezy out in the Bay, which made the water a little too rough for comfort, but we thought it would calm down overnight. Unfortunately, it got even worse before morning and none of us got much sleep. We had turned over the master stateroom to Todd's parents so we were sleeping in the guest stateroom and it was very noisy with waves slapping the bow all night. Todd even got up and tried to sleep on a cushion in the salon but that didn't work either. The next morning we pulled anchor and headed for Sarasota. After dropping anchor near Marina Jack's we spent the afternoon napping and relaxing. Monday morning Todd took Bill & Marilyn to shore in the dinghy where they had breakfast and spent a few hours walking around town. When they returned we pulled anchor and went as far as Englewood Beach where we enjoyed a beautiful, calm evening. Our anchorage an Englewood Beach where a small Hobie Cat was anchored behind "Life's2Short." Tuesday turned windy again and our plan to go to Boca Grande was scrapped when we got in there and decided the wind was funneling through the anchorage just a bit too much for us to want to try to back up to the mangroves. So we went back out into Charlotte Harbor and traveled a few more miles to Pelican Bay where we anchored for the evening. It was still quite windy and we didn't have much protection but we found the best spot we could and made do. By morning the wind had died down and it was a beautiful, sunny day as we made our way to Ft. Myers Beach. When we reached Matanza's Pass we went over to fuel up at Ballard Oil where we took on 208 gallons at the bargain price of $3.70 per gallon which, by comparison, was something of a bargain given that the nearby marinas were charging $4.05! Todd's parents enjoying the view from the bow as we made our way through Pine Island Sound. The place we were supposed to tie up for the evening was occupied by a sailboater who had decided to stay an extra night so we tried, unsuccessfully, to tie up at the end of the dock where a shrimp boat is normally located and ended up going back over to a dock on the other side of Ballard Oil and tying up for the evening. After cleaning up we went over to Bonita Bill's to see the gang before going to the Parrot Key Caribbean Grill at Salty Sam's where Todd's parents treated us to a wonderful meal. Bill & Marilyn left Thursday morning about 9:30 to head back to Orlando to pick up their dog Ginger and then on to Astor, FL where they have their motor home and boat on the St. John's River. It was nice being able to spend some time with them aboard "Life's2Short" and we hope they enjoyed the journey from St. Petersburg to Ft. Myers Beach. I also have to mention that each evening we played a card game called Skip-Bo and the girls triumphed over the guys with a final score of seven to three. Sorry guys - better luck next time! Todd and I moved over to the dock at Bonita Bill's early Thursday afternoon and then went to the bar to say hello to Byron, one of the guys who works there. Later that afternoon we were resting in the aft cabin when another boat hit "Life's2Short" as it was leaving the bar. Several people at the bar saw it happen but the guy didn't even stop. Even though he hit us pretty hard, it only scuffed the fiberglass on the rear starboard edge and, thankfully, didn't do any major damage. Todd spent a few hours Friday morning washing a portion of the boat's exterior and then we decided to tackle the laundry. We carried everything up to the trolley stop and rode the few miles to Summerlin Square only to find that the laundromat we had used last year was no longer there! Since we were on foot, we ended up calling a taxi to take us a few miles further up San Carlos Boulevard to the nearest laundromat. George & Mary, who we met aboard "Love Knot" on Pickwick Lake this past summer and have seen off and on throughout the summer and fall, live in Englewood near where we anchored Monday evening. They were planning to go to the flea market in Ft. Myers Friday morning and then come see us on the boat that afternoon so we asked if they would mind picking us up at the laundromat on their way, which worked out great for us. They had another couple with them (Gil & Nancy) and we spent the afternoon aboard "Life's2Short" visiting and enjoying Mary's wonderful hors d'oeuvres. Thanks, Mary! George & Mary are on the right as the gang poses in front of Bonita Bill's. Later that afternoon we spent some time visiting with Ken aboard his shrimp boat, "Miss Cher," and then went to Bonita Bill's to listen to a little karaoke. It got very windy overnight and into Saturday with sustained winds of forty miles per hour. 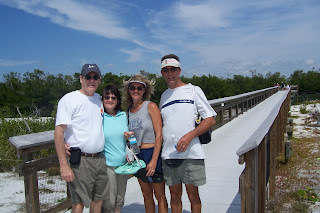 We had planned to walk across the bridge to the beach for the annual shrimp festival but decided to wait until Sunday. As the Captain was messing around in the engine room that afternoon, he discovered that the oil cooler on the starboard engine had corroded and was leaking. Thankfully, he discovered it while we were here rather than in the Bahamas. Good job, Captain! Sunday was still a little windy but nothing like Saturday so we walked over to the shrimp festival on the beach and spent a few hours touring vendor booths, eating shrimp and fresh kettle corn, one of my favorites! Since Kirby was working at Bonita Bill's, we stopped in on our way back and spent a few hours enjoying the afternoon and watching guys fish for snook off the dock. The 50th annual Shrimp Festival gathering on Ft. Myers Beach. Monday was spent getting ready for our next visitors, Bob & Linda Eckels from Springfield, MO, who were flying in to St. Petersburg and renting a car to make the trip to Ft. Myers Beach. I spent the day catching up on bills and other paperwork, reviewing our taxes, and just messing around the boat in general. Todd ordered a new oil cooler, removed the leaking one and cleaned the salt water and corrosion from around the engine, washed the remaining exterior of the boat and waxed the eyebrow (the front portion of the boat below the flybridge). All-in-all, a busy day. Bob & Linda arrived about 11:00 Tuesday morning and we had a quick brunch before heading downtown to watch a spring training game between the Red Sox and the Mets. The game was sold out so we had "standing room only" tickets but it was a nice day with a brief afternoon shower and the Red Sox prevailed four to three. We had planned to buy some shrimp from Ken for our evening meal but he wasn't around when we returned to the boat so we went over to the beach and had a late dinner at The Beach Pierside Grill. Need the sign say more? Linda & I weren't quite as enthusiastic as the men about watching the Mets play! When Todd and I were walking across the bridge Sunday to go to the shrimp festival, we were surprised to see Greg & Sandy's boat, "Latitude Dancer," at Matanza's Inn. We originally met Greg & Sandy the summer of 2006 in Demopolis and have seen them off and on since, most recently at the marina in Columbus, MS this past summer where they told us they would probably go to the Bahamas again this spring, so we thought they would be there by now. At any rate, Todd called and left them a message that we were in the area so Sandy stopped by the boat Wednesday morning to say hello and invited us to go with them to the Moose Lodge Saturday evening for steak dinner and dancing. They have their boat on the market and almost had it sold, which is why they decided not to go to the Bahamas. After Sandy left we got ready and drove to Lovers Key at the south end of Estero Island where we spent the next few hours combing the beach for shells with Bob & Linda. Traffic was really backed up on the return trip and we were all more than ready for lunch by the time we got back to the beach, about 4:30 p.m. Unfortunately, the service at The Barking Shark was pretty bad and the meal was mediocre at best. We spent the rest of the afternoon and evening just hanging out on the boat and playing Catch Phrase, which turned out to be pretty hilarious... Bob, you eat Chinese food with chopsticks, not toothpicks (you had to be there!). The gang heading over the the beach at Lovers Key State Recreation Area. Bob & Linda with their rented "rag top." "Bob, the car is still running... again!" We slept in on Thursday and went to the Channel Mark for a wonderful late breakfast where we ran in to Kirby on his day off from Bonita Bill's. It was an absolutely gorgeous day and the rest of the afternoon was spent hanging out on the dock at Bonita Bill's and on the sundeck enjoying the scenery. That evening we cooked a couple of pounds of Ken's fresh shrimp and munched on toasted cheese bread and fresh veggies and then played Catch Phrase until we were ready to turn in for the evening. The chartered fishing boats are in so it's feeding time for our feathered friends. Bob & Linda took off Friday morning about 9:30 for the trip back to St. Petersburg where they had an early afternoon flight to Springfield. Kirby had offered to let us use his car (affectionately known as "the Batmobile") for a major grocery run to Wal-Mart in preparation for our trip to the Bahamas, so we spent the rest of the day shopping, hauling everything to the boat, figuring out where to put it and getting it put away. Todd replaced the oil cooler Saturday morning, rearranged some storage spaces and worked on the boat's intercom system before being asked to work at the tiki hut at Bonita Bill's that afternoon during Peppermint Patty's performance. I spent the day catching up on blog events to date and then we met Greg & Sandy, along with two other couples, at Bonita Bill's and made our way to the Moose Lodge for dinner and dancing. Two more couples joined us at the Lodge so we had a total of twelve in our group. The steak dinner was really good, as were the performers, and we all had a great time. Thanks to Greg & Sandy for inviting us! Sunday was a quiet day, primarily spent reading and relaxing on the boat, although Todd did go help prep some food in the kitchen at Bonita Bill's that afternoon. After he was finished we went to the bar and split a sandwich before retiring to the boat for the evening. Monday turned very windy again with seas forecast to be quite rough for the next several days so it looks like we'll be here a few days longer than originally planned. Todd spent Monday morning buffing and waxing a portion of the boat while I baked some banana bread and piddled in the kitchen. That afternoon Todd went over to help Ginger at the tiki hut again. I went over a few hours later and we both ended up working (or playing at working) most of the evening. Ginger & Captain O'Lanning, aka Irish Pimp Daddy! Tuesday was another quiet day on the boat. Todd wandered over to Bonita Bill's a few times and ended up emptying the trash and washing some of the lunch crowd's dishes but neither of us strayed too far. The wind continues to blow hard today and was especially strong this morning about 5:00 a.m., waking both of us up. According to the coastal waters forecast it isn't supposed to calm down much until the weekend so I'm not sure when we'll actually pull away from the dock. Right now it's looking like Saturday but we'll see. In the meantime we wanted to update you on the events of the past few weeks. Once we leave Ft. Myers Beach, our plan is to go to the 10,000 Islands area, just north of the Everglades, and spend some time with Mike & Mary aboard "WhatDazeIt?" before continuing on to the Keys where we will spend a few days on Islamorada with Paz, a college friend of Todd's from New Jersey who will be vacationing there the first part of April. After that it's off to the Bahamas. We should be able to post another update before we leave the Keys; after that we're not sure since we don't know what kind of Internet access we will have in the islands but we'll update as often as possible.